Deadly missiles are flying in every direction, the ground all around you is crumbling away under the pressure of multiple explosions, and an absurdly giant statue of a donkey is descending from the sky. Yes, this sentence could only be made possible by Worms - Team17’s mega-hit franchise which sees players hurtling various projectiles at one another in deadly battles between overly British worm characters. Worms W.M.D. has flung itself over from other consoles to the Switch meaning that even more mayhem is about to begin. The basic concept of the game is simple; anywhere from two to six teams must take part in an epic, turn-based battle across a large war-zone with the last team standing being victorious. 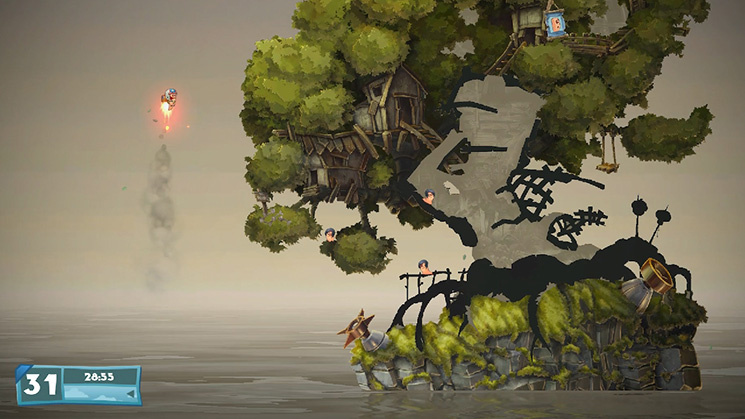 The series has returned to its 2D roots, having players zoom in and out and scroll the camera across vast maps, and many fan-favourite items have returned, such as the aforementioned Concrete Donkey. There are, however, plenty of new additions to change things up and, for the most part, these are very welcome indeed. Worms W.M.D. introduces vehicles which can be used both as weapons, and for defence. There are three main vehicle types available: tanks, which can allow you to travel over rough ground and can fire six explosive bullets; helicopters, which must be flown over the top of the battlefield, heavily firing down on opponents with a machine gun from above; and Mechs, which can help you to move around much quicker and can send enemy worms flying across the stage with a hefty punch. The vehicles aren’t overpowered, though, as each one feels like it is a risk-reward type of system. Vehicles are susceptible to damage and will eventually blow up – if you’re sitting inside a vehicle for protection but an opposing team does enough damage to it you’ll find yourself being caught up in a mighty explosion. Also added to the game are buildings, which allow worms to take cover from enemy attacks (unless an opponent wiggles their way inside) and crafting, which changes the basic Worms formula quite drastically. Crafting allows players to build weapons either during your turn, or an opponent’s (which is a great way to fill the time). To build weapons you’ll need to either dismantle the weapons you start the match with for parts, or find parts on the battlefield inside crates. When you have enough parts to build something you can start the crafting process – weapons take one complete turn before they are ready to use. Often, being able to craft the perfect weapons is the key to success – you’ll really need to know every weapon inside and out to be truly successful, making sure that you have the most useful selection ready to you depending on enemy locations. The game’s training mode will teach you how to use some of the more basic armaments but, if you want to see everything that the game can offer you, you’ll have to commit a lot of time to some trial-and-error exploration of each weapon in non-important matches. There is a huge amount of customisation available to you, too, including some new content exclusive to the Switch version. Of course, each match is customisable to your preferred play-style as you can work towards crafting the weapons that you want to use, but you can also change your appearance, voice, and more. Content from the All-Stars pack which is available on other consoles returns here so, if you’d like, you can dress up your worm in outfits based on other Team17 games such as Yooka-Laylee or The Escapists and you can also fully customise the game’s settings when playing in multiplayer mode, allowing you to create very specific rules if you wish. We’ll come back to this a little later on, though. 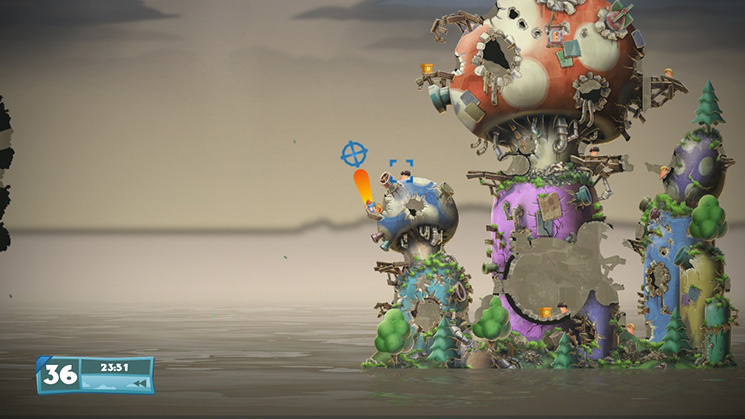 The stages you can play in (including the new space theme, Wormhole, which is a timed-exclusive for the Switch version) are made up of beautiful, hand-drawn art which, almost upsettingly, can be completely destroyed. With every explosion, huge chunks of the battlefield will be taken away leaving potentially deadly holes to the water below. 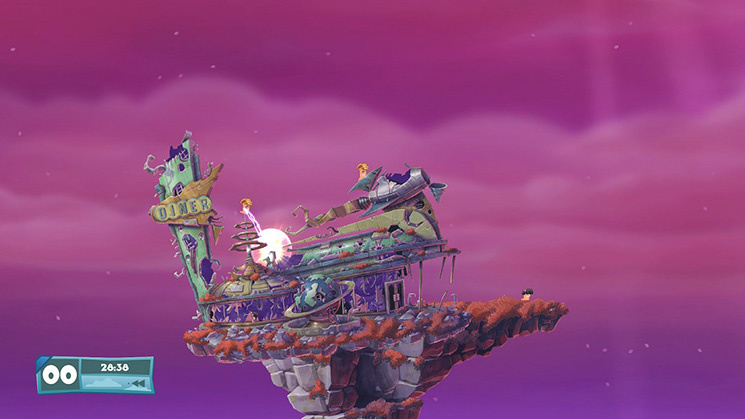 Unfortunately, this can highlight one of Worms’ biggest issues – moving around. Travelling around the warzone can be a real nuisance at times with jagged edges in the scenery preventing your worm from being able to jump around as you’d like it to. With a timer restricting your actions in each round that you have, things can get rather frustrating when you’re wasting precious time getting stuck in a hole. Between the main 30 campaign levels, challenge missions which need to be unlocked, and added ‘Extra’ and ‘Bonus’ missions, you’ll have a pleasingly large chunk of single player action to get your teeth stuck into. These start off being relatively easy, but some of the extra missions and those towards the end of the campaign can be fiendishly difficult. Starting off in the single player modes is definitely a good idea, though, as we often found ourselves learning from our mistakes with each play-through of the trickier missions. You can also take your warfare online if you wish which is arguably where Worms can shine the brightest and heading to the multiplayer section of the game presents you with various options. Firstly, you can play 1 on 1 ranked matches which allow you to work on increasing your in-game rank and receive rewards for doing so. You can also jump into a local multiplayer game either on a single Switch, where you can either use individual controllers or pass around a single Joy-Con if you prefer, or by connecting multiple consoles over a hosted local wireless session. As we touched upon briefly earlier, the customisation options for online matches are astounding. You can change things up almost exactly to your very specific tastes, altering the timers for each round, your health, the scenery, how you take damage, which weapons are available, crafting options, and more. Unfortunately, the Switch version of the game does not allow you to create private lobbies to invite friends, meaning that you’ll be unable to set up the matches of your dreams with your best buddies. With so many games struggling to adopt a friend invitation option to online play on Switch, it seems like the console is rather unforgiving towards developers which is naturally a huge shame, especially since playing Worms online with friends can be incredibly fun. 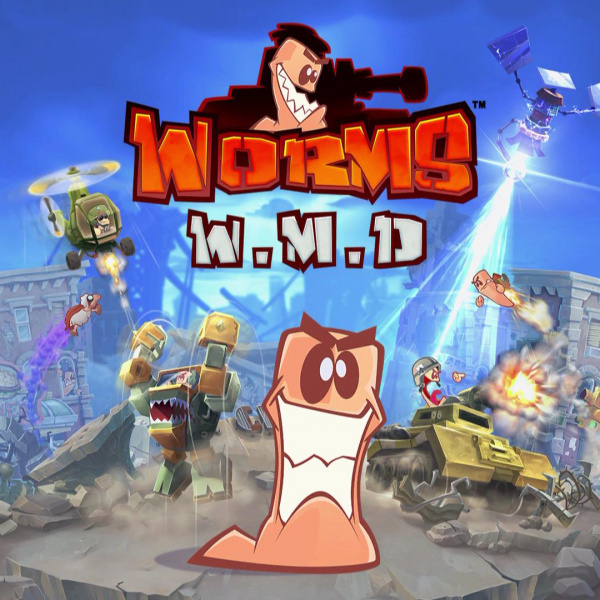 Worms W.M.D. is a good example of a game that can use its original, winning design format, spice things up with a whole bunch of new features, and still come out as an impressive title. The introduction of crafting weapons between rounds adds to the complexity of the strategy in a good way – the game can’t be picked up as instantly as games such as Mario + Rabbids Kingdom Battle, but with time and dedication, you’ll find a seriously rewarding tactical battle game. Some niggling factors such as the awkwardness of moving your character around, the fact that your movement and weapon’s aim are frustratingly locked to the same control stick, and the unfortunate lack of ability to play online with friends prevent the game from being the amazing experience it could have been, though. If you love the Worms franchise or games of the genre you’ll likely have a lot of fun by grabbing a copy of this game, just bear these little things in mind as you make your decision. Played for a little while earlier. Pretty fun. Nothing mindblowing but it's a Worms game that isn't terrible for the Switch, which is all I need. Yeah, this is about whether you want Worms on a portable machine, isn't it? Other than that, if you own any other Worms game, there's never a huge incentive to get the next one. I’ve never ‘got’ Worms. It always came across as a good idea wrapped up in a bad idea; and I’ve not found it fun. Maybe I’m missing something? I was a big fan of this type of games starting from Tank Wars (aka BOMB) on PC, Worms, especially 2 & Armageddon has been a blast against my friends. But I've lost interest in this genre years ago so I'll wait for a decent discount before buying it. 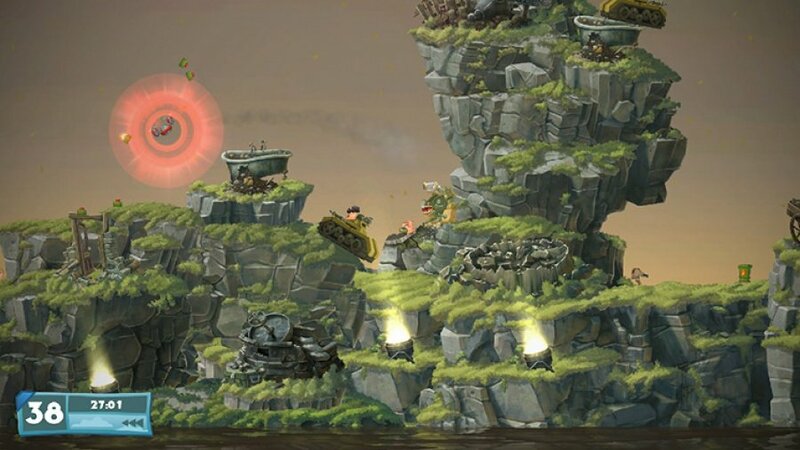 It´s the best Worms game since Armageddon IMO. Not sure I agree with the issues about the control scheme. Mapping aiming to the same stick as movement makes sense, when the other stick controls camera. Also the game is designed for single joycon play with couch coop, so putting on the single stick would make switching to single joycon mode a bit easier. Still, I agree with the overall sentiment. If you like Worms, you´ll love this. If you don´t, then it probably won´t win you over. Sounds like they have made worms too complicated to me, crafting weapons? Just give me a shotgun and banana bombs from the original and I'm happy. Ok, so you can play as Yooka Laylee, BUT WHERE IS THAT FECKING GAME FOR SWITCH TEAM 17?????? Yes, it would be more enticing with the niggles fixed, though. Love worms but Can't afford it at the mo' maybe if I nip round to their offices and beg they'll take pity and give me a download code. @Bunkerneath Team 17 is not doing the port to switch, right? @Bunkerneath Playtonic probably thought it wouldn't be a good idea to launch Yooka-Laylee so close to Mario Odyssey. Gives them time to make a perfect port and something else to look forward to early next year when there aren't so many games coming out. Works for me! Why is the EU price on this site always in pounds? We use euros. Gotta say, the idea of pulling out my switch for a game of worms with my brother wherever we might be is really appealing. As others have stated the tricky navigation of the worms has always been a part of the game. Its supposed to be a part of the risk/reward part of the game. Do you make a tricky long distance shot, or try to move closer with the risk of messing up? I just bought it and it was good. I haven't played it since Windows XP. A truly addictive game. I'm actually waiting for the physical release though. Plus with lack online feature deducts the score so hard. But I'm still loving the game anyway. Now waiting for my Xenoblade 2 pre order. @BigKing Thank you. If you put down UK/EU, you really ought to put down a GBP/EUR price as well. The /EU doesn't mean anything right now. On-topic: Completely forgot this was coming to Switch, but am most definitely getting it. I've loved playing this series ever since I was about... six, seven? @SyntheticPerson That's exactly it. 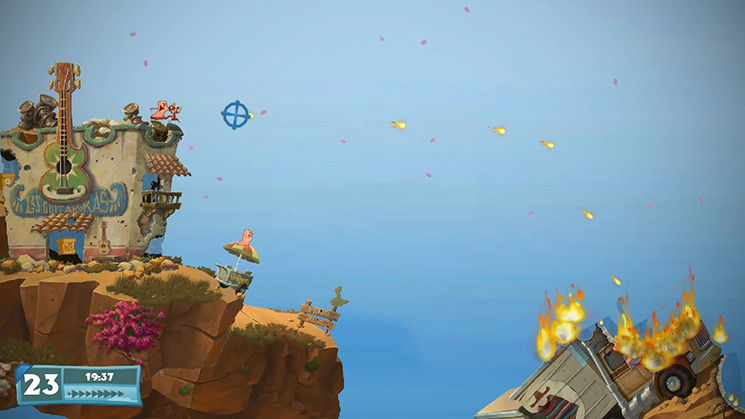 If "It´s the best Worms game since Armageddon" means something to you, you know this is worth getting. Worms 2 was a big part of my childhood, so I'll double dip for portable worms. I loved worms on the Amiga 1200. “Incoming” ‘exploding sheep’. Great memories. Will probably take a punt on this and introduce my own kids to the fun. Would love to see some Team 17 classics on Switch like Alien Breed and Lemmings. A remake of Alien Breed 3D for Switch would be fun. I’ve only played Open warfare 2 on PSP. I remember there being a level creator. It was okay but I still enjoyed making my own levels. Is there a level creator in this game too? If so, how is it and is there any touch screen functionality with that mode? Are there other bonus modes too? I hope to get this one day. If there’s a discount, games lull, or I have left over Christmas money. How many people can play on the same TV screen? Can each one use a joycon grip or a pro controller? A decent Worms game. Enjoyable and as it should be. Menu's a bit messy with the controller. Could do with a touchscreen. ... ... if only the Switch had one. Additionally, I like to play Worms without music, so I turned the music off only to find it making "ambience" noises. A never ending air-raid siren, and distant gunfire/explosions. No way to shut that up without disabling all other sounds. Other than that, get in!!!! Used to love an online game called Arcanists that was supposedly a knock off of Worms. I'd really love to give this a go, but I don't have the money or time right now thanks to all the great games recently and the upcoming Xenoblade 2. Might have to wait for a sale. @Laxeybobby Have you ever played the PC/console remakes (or rather: re-imaginings) of the Alien Breed Trilogy? They're actually quite good. You can get them on Steam, Xbox 360 and PS3. The Xbox version is even available in physical form, with all three games on one disc. Worms games are almost always fun to me. The only exceptions were the awkward 3D/first person games they made several years ago, but other than that, I always enjoy playing a couple of quick levels every now and then. Subtracting points or criticizing the game for "difficulty of movement" due to the gaps created by the various explosions/weapon impacts is ridiculous. That has always been present in the Worms games ever since the very first one. That is what parachutes, girders, bungees, teleports and rocket packs are for. Any experienced Worms player should easily be able to navigate the changing environment with these. I love how the review starts (the first sentence). Worms is one of the very few exceptions where a turn-based system is not dull for me, and it's great to hear that they didn't just remake the old game (in other words a retro game) but actually added a lot of new features to it! The crafting sounds really promising. Meanwhile, the aforementioned control issues were present in all Worms games that I've played and it's a bit disappointing to hear that they didn't fix that. It's also mind-boggling how so many third party developers are struggling to offer online multiplayer with friends while Nintendo offer exactly that in their games. Maybe the problem is that the third party developers are porting their games from other platforms? Im sure a tailor-made Switch version (which is started from scratch) wouldn't have these problem. But Nintendo could also try to resolve the situation by assigning one of their developers to help/guide third party devs with their online multiplayer modes. I was never a Worms fanatic, but I had a lot of fun with it back in the days. So I'm really happy that they didn't screw it up and will buy it shortly. @Laxeybobby Ah, okay. So, Steam doesn't work on Mac, then? Genuine question, I know literally nothing of Mac computing. I always thought that quite a bit of software & games also has a Mac version. @ThanosReXXX i dunno, i always had a soft spot for that worms game on GCN. That, and True Crime LA. @gatorboi352 I liked True Crime: Streets of LA as well. Played it on GameCube and on PC. I also played all the 3D Worms games, or rather: I tried them, but for me personally, it just didn't feel like Worms. And if I'm not mistaken, they also weren't all that successful, so perhaps that's also why Team 17 decided to go back to the original 2D gameplay since then. But hey, tastes differ, so if you personally enjoyed it, then that should be all that matters. It would have been great to mention it in the review. Good question about the MacBook. I’ll look it up. Sounds like everything I need and then some is in the game. I gotta wait for a price drop, but as soon as it's reasonable, I'll be scooping this one up. "and the unfortunate lack of ability to play online with friends prevent the game from being the amazing experience it could have been, though." Go to Multiplayer, Host Public Game then get your friends to join the room. I've been playing online with my friend and randoms for most of today. i don't remember playing a worms game that ever controlled well. must be why i never could get into them other than at parties here and there where someone had it on whatever console was connected to the tv. @Dazran303 Hey man, thanks for the info. So you're 100% able to play online with people on your friends list? I've heard conflicting reports. Haven't had the chance to check myself, and I wanted to talk my mate into getting it... but only if we can play together. Oh and btw, I watched your whole MH3U let's play and it was good fun. @Dazran303 @Moon it should be mentioned though, you basically create a public room that your friends will be able to see within the games "room search" feature. It's nice this way though so if you want to, you and your friend can play on your own or wait for randoms to join too. why does this review (and a few comments) say there's no online, when the game itself, and at least one comment says otherwise? Did the reviewer even play the game?